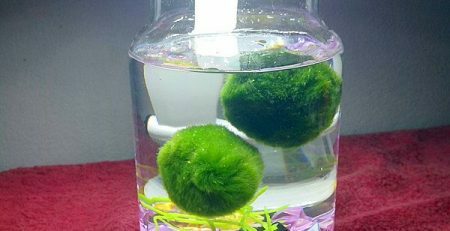 Once you see the cute, alien-like appearance of marimo balls for yourself, you’ll understand why there’s such a high demand for these fuzzy green spheres. Unfortunately, it’s this high demand that results in the sale of many impostor marimo balls in the marketplace. 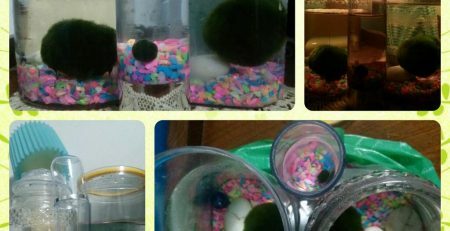 Here’s our guide on how to tell a real marimo from a fake. Colonies of wild marimo balls have only been known to form in freshwater lakes in Iceland, Scotland, Japan, and Estonia. Marimo are especially popular in Japan, where they are considered a national treasure and have been labeled as a protected species since 1920. Marimo balls tend to grow fairly slowly, at a rate of 5mm per year. The largest marimo found in Japan’s Lake Akan are particularly large at 8-12 inches. The balls are green all the way around and densely packed with photosynthetic fibers, which guarantees they can photosynthesize from any angle. They are used to surviving in low light conditions and can live comfortably indoors in partial sunlight. 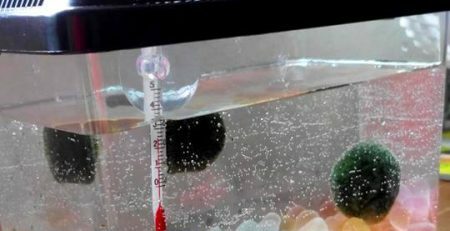 Marimo balls can take on peculiarly lifelike traits such as rising and sinking in response to light, rolling over to dump off debris, and rotating positions with other marimo balls. They also reproduce asexually, budding smaller spheres that eventually detach from the main marimo ball. This reproductive trait is one of the main ways to distinguish real marimo from fake marimo. When holding them, marimo balls will feel heavy with short, dense “hairs” that are dark green in appearance. The growth of the hairs should be even and the ball should remain intact when squeezed. In fact, it’s recommended that you occasionally rinse your marimo balls of debris and squeeze them out to maintain their health. 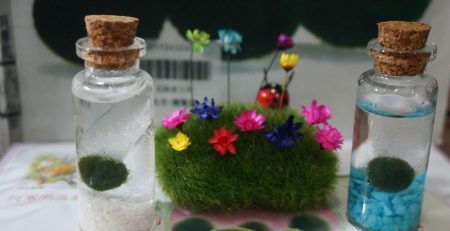 Hand-rolled Marimo are sold locally as souvenirs, but ever since Japanese scientists devised methods for farming Marimo over three decades ago, artificial Marimo are commonly purchased from aquaria and kept affectionately as “pets” (perhaps not unlike America’s 1970s ‘pet rock’ fad). 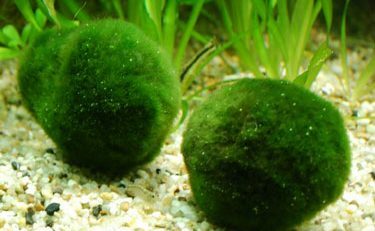 Artificial Marimo differ considerably from wild grown in terms of how their internal filaments are arranged, however, this does not affect their outward appearance. 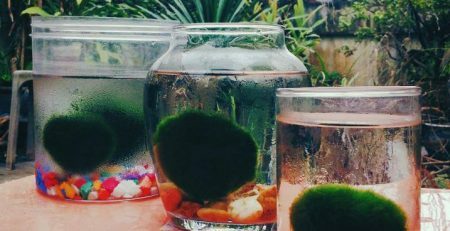 Since marimo balls resemble pom poms in the first place, it’s easy to see how synthetic marimo could look quite similar to their real counterparts. However, some of these balls can be made out of fiberglass fibers that may harm other living animals in your fish tank. 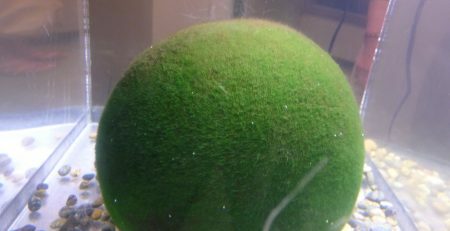 Another common form of fake marimo is a spherical moss ball artificially made out of another type of moss, most commonly java moss or Christmas moss. 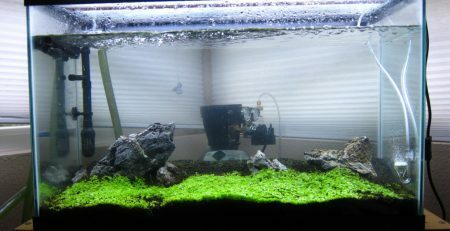 Sometimes, the moss is wrapped around a ping pong or tennis ball to assume the form of a larger, older marimo ball. 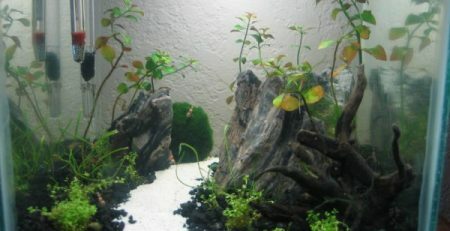 These are easy to tell apart from true marimo, since the moss fibers are typically longer and more loosely packed. As mentioned earlier, marimo balls are algae balls, not moss balls. 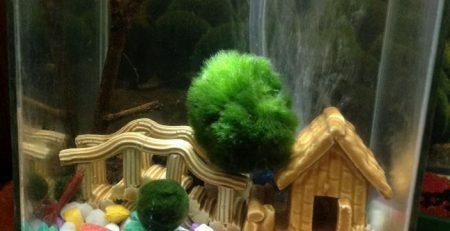 The last and most commonly overlooked form of fake marimo is hand-formed from the free-floating or carpet-like filaments of the same species of algae that comprises true marimo balls . These manmade balls will never grow or reproduce like true marimo because the filaments are not meant to take on a spherical shape. Upon closer inspection of these fake marimo balls, you should notice a seam that runs along the ball, indicating where the algae was meshed together. It should be quite easy to coax these balls apart, whereas a true marimo will be seamless and dense.